Transferring lines back and forth between the spools and reels can be something of a "putting ketchup back in the bottle" job. Here's a gadget that makes it easy, is quite portable for use in the field, and is quite easy to construct. The pictures demonstrate the concept. You may wonder whether tightening the clamp on the rod shaft might damage it. I tried to damage a junk rod by tightening the clamp as tight as I could with my fingers and didn't hurt it. This was quite a bit tighter that it needed to be for the gadget to work. The dimensions shown are not critical. The material is nominal 1x2 pine which is actually about 5/8" x 1 5/16". 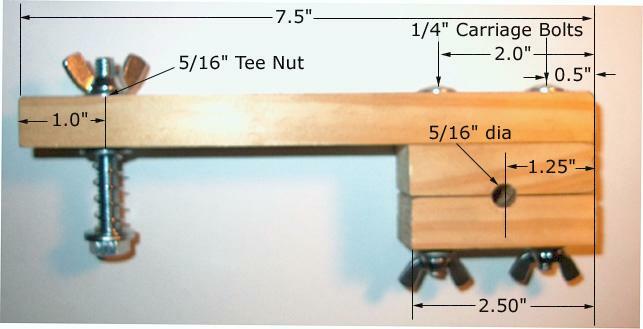 The spool bolt is screwed into a TEE nut which is set flush in the wood and the wing nut locks the bolt when tightened. 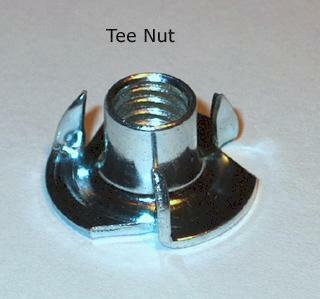 If you are unfamiliar with TEE nuts this is what they look like. These are suggested, what worked for me, but as with the dimensions, they are not critical. To set the TEE nut, you need to bore a hole the size of the outside diameter of the tubular part. Set the TEE nut in place by hammering it into the hole you drilled in step one. The hole between the two blocks for the rod shaft is bored with the blocks clamped together. It is best done with a drill press with a vise to get a straight hole. If you don't have a drill press, it is probably better to make the hole by filing the halves with a rat tail file. Clamp the three blocks together when you bore the 1/4" holes for the two carriage bolts. Then enlarge the holes in the outer block of the rod clamp to 5/16". That way it can "float" a little bit to seat itself on the rod when you tighten up. The handle on the spool is just a piece of 1/2" dowel screwed to the outside by a wood screw from the inside. Alternatively, you can just make a small hole in the spool and turn it with a nail. The spring on the spool bolt provides a little friction brake on the rotation of the spool. 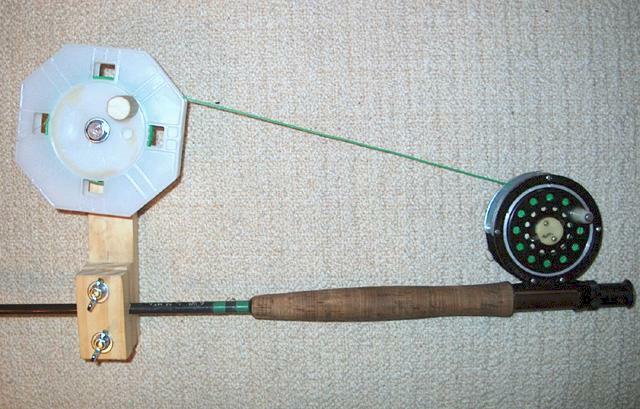 Washers on both sides of the spool and between the spring and the wood will help it turn smoothly.